Cwmni Da have continued their collabarative work with Llanbedrog’s Oriel Plas Glyn y Weddw by supplying interactive screens to a new development at Wales’ oldest art gallery. 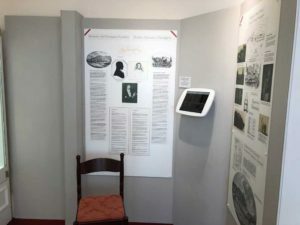 The wall-mounted iPad screens use a combination of archive footage, images, audio and specially commissioned videos to offer a wide variety of engaging historical information to gallery visitors. The new facilities were officially opened by Dafydd ap Tomos at a special event on 11th June, 2018. Other developments at the venue include enhanced environmental conditions to enable the display of historical objects, better arts workshop provision and specialist art storage facilities. Cwmni Da were delighted to add to their growing multimedia interpretation portfolio which has recently included an award winning iBeacon project at the Plas, an interactive iPad visitor guide at Ruthin’s Nantclwyd y Dre in Ruthin, and a major multimedia installation at Yr Ysgwrn Visitor Centre in Trawsfynydd.